With 1467 expansive acres, including 12 miles of lake frontage, Emigrant Lake offers various recreational activities including RV/tent camping, fishing for bass, crappie, trout, boating, canoeing/kayaking, water skiing, swimming, picnicking, hiking, playing on the playground, or sliding down the refreshing 280-foot twin flume water slide. Set up your family reunion, company party, school group function, or wedding reception at one of our four covered Group Picnic Areas. All areas offer electricity, tables, barbecues and nearby restroom facilities. Group Picnic Areas can accommodate from 125 - 300 people and are available to groups from 10 am to sunset. Whether you want to be close to the water, by the boat ramps, near the campground, next to the water slide or playground, one of our picnic shelters will be ideal for your group. 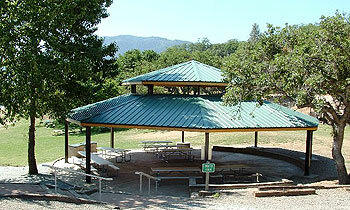 Group Picnic Area Reservations are not required, but recommended, and must be made by phone through the Parks Office.